It was a busy day at the CCFC with many quads and different exciting games and results. FM Leif Pressman had many long hard fought games and managed to come out on top of each to win quad one. Quad two was about as close as it gets. Eric Zhang and Dennis Li tied for first just a half point ahead of Joseph Bihlmeyer. 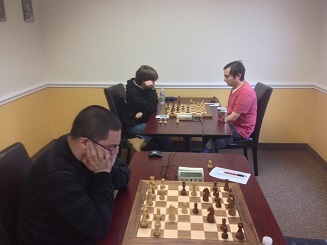 The third quad was also a tie between Leo Bykhovsky and Brandon Wang, each with 2/3. In perhaps the most surprising and outstanding result of the day Vincent Xu entered quad four as the bottom seed but won the tournament with 2.5/3 and picking up over 150 fresh rating points! William Ewald won quad five with seeming ease to push him over the 1400 mark. In the final quad it was the veteran Andrew Carozza who took sole first place amongst the youngest competitors with a perfect score.